Life Journey is an interactive installation that confronts visi­tors with the confinement imposed by a wheelchair. The piece contrasts the immobility of the visitor, sitting motionless in a chair (which is attached to the floor) with the illusion of high-speed travel, created by visual projections on both sides of the user. Accompanying the visuals are sounds of highway traffic and the force of simu­lated wind. The media employed to create the installation include a video component, a motorized wheelchair, and other mechan­ical and electrical elements. To explore the installation, a visitor enters a dark space with a single illuminated wheelchair in the center. 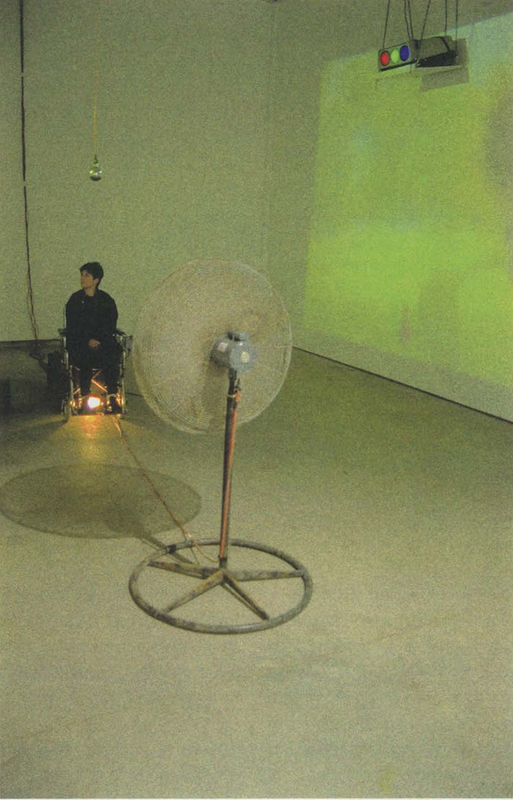 As the visitor sits in the chair, the wheels begin to spin, and video projectors suspended from the ceiling on either side of the chair are activated, as is an industrial fan located directly in front of the chair. The projected visual images consist of 70-mile­per-hour traffic, accompanied by appropriate sounds. This vicarious “journey” continues as long as the visitor remains seated. The environment simulates the sensation of whirling through the wind like an automobile. Life Journey gives the visitor the ability to move virtually from one space to another with the understanding that individuals who live with a wheelchair have limited mobility in parts of their bodies. While the visitor remains seated, the wheelchair becomes a contradiction of motion. This juxtaposition of mobility with immobility heightens the awareness of the loss of control that one feels when confined.